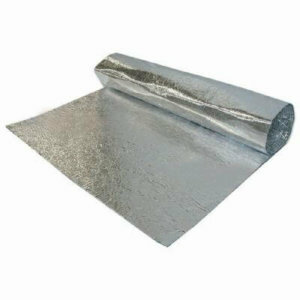 Sisalation is an aluminum foil reinforced insulation material. It is a craft paper, aluminum foil, synthetic fiber and polyethylene lamination. Often used in schools, warehouses, commercial and residential dwellings and hospitals. It reduces heat loss in winter and reduces heat gain in summer. When sisalation is used under tiles it acts as a waterproofing membrane. It is highly reflective. It will enhance lighting in a building when installed as an exposed internal roof lining. To a certain degree, dust will eventually affect the insulating abilities of foils. All insulating foils are affected by dust over long periods of time. In the case of sisalation the foil at the bottom will continue to provide effective insulation when adjacent to an air gap. Tested by the SABS and NBRI for heat transmittance (‘U’ values) for thermal insulation, and by the SABS and Fire lab for fire indices. Sisalation, manufactured according to ISO 9001:2000 remains an industry leader and is the first reflective foil insulation product to be awarded the SABS mark of quality.